Welcome to the third installment of what seems like the most complicated and longest play date ever. Even though it has taken three whole days to write about, it really only lasted for a couple of hours, I promise. Kinley had so much fun with her heart soup on Valentine's Day, that I thought we should do it again St. Patrick's Day style. It was the biggest hit of the day. 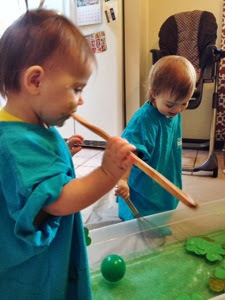 Both of the girls were sopping wet, covered in glitter, doing high-fives with their whisks, and smiling their biggest smiles during this activity. 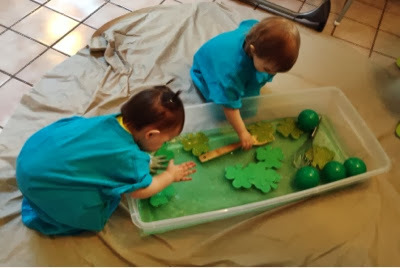 Who doesn't love splashing around in green glitter water with their best friend? 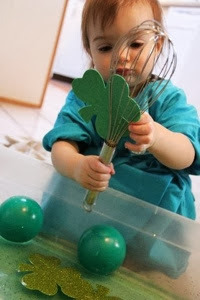 This is a super easy activity and can be adapted to any theme or holiday. 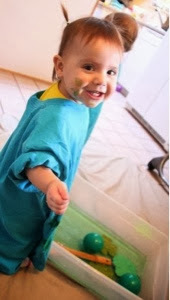 Just plop that bucket of soup on the floor and watch the fun (and sparkly) mess happen! Like I said, these girls had a blast. 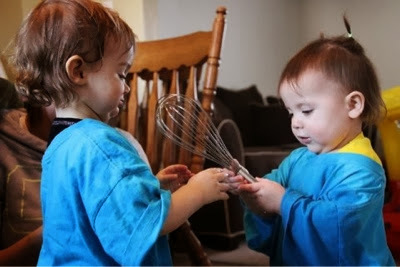 Obviously, you can create your own recipe with whatever green stuff you have on hand, but I would definitely not skip the whisks. That was, by far, their favorite part of the whole activity. 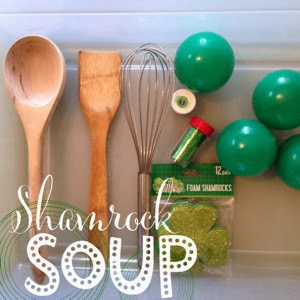 We showed them how to "stir, stir, stir" and they practiced that for a good twenty minutes, well that and giving the foam shamrocks quality tests with their teeth. It was a lot of work for Jody and I to get this whole afternoon ready and execute it, but the girls had so much fun that it was beyond worth it. 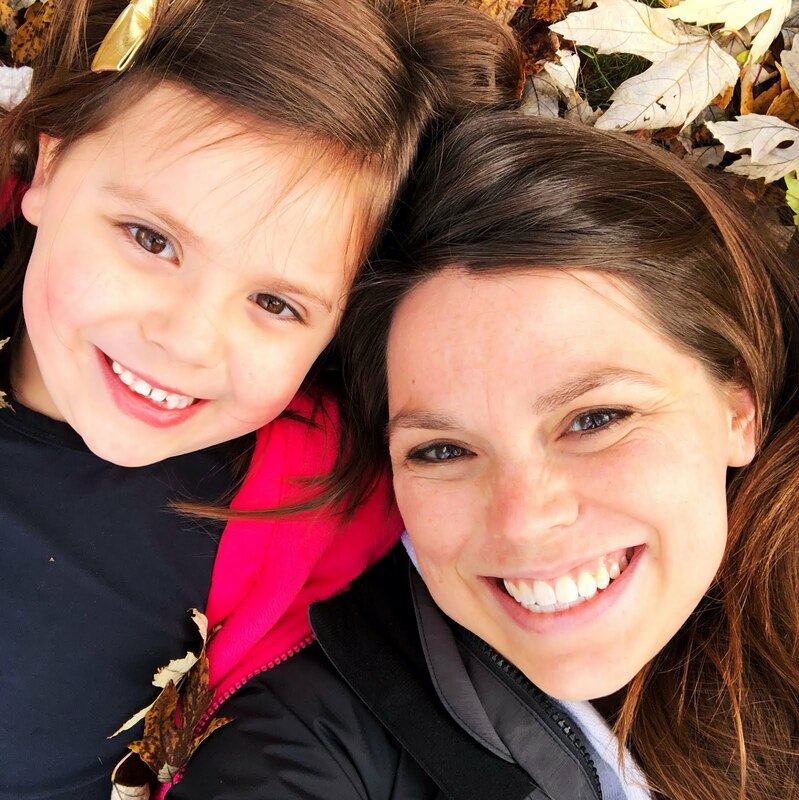 You don't have to go as crazy as we did, but it's always fun for kiddos to get together with their friends, and even more fun for moms to have another grown-up person to talk to. 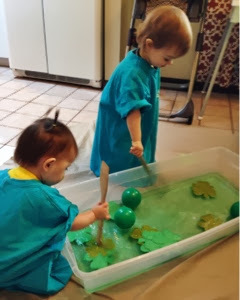 Our sweet little girlies wore themselves out with all the soup stirring, so Cate and Jody headed home, Kin headed up to her crib for naptime, and I got busy cleaning all the glitter, green fingerprints, puddles and paint dishes. And just as I finally plopped down on the couch, poured a fresh, icy glass of Diet Pepsi, kicked my feet up, and clicked Friday's episode of Ellen on my DVR list, Princess Seahorse woke up and wanted a snack. Back to work. Just another day in the life of a SuperMom. 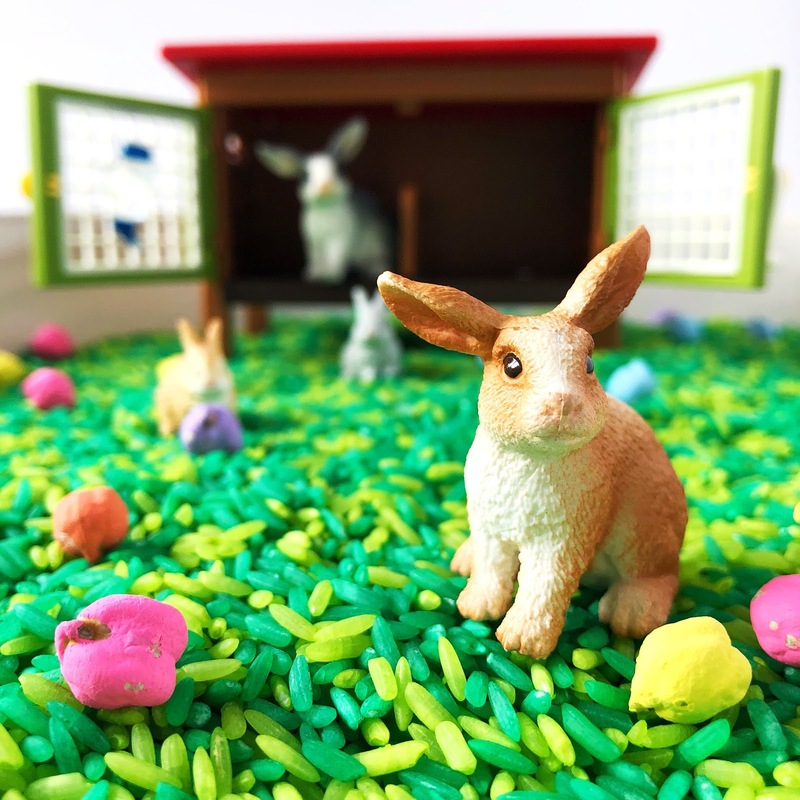 We are planning an Easter themed play date next--think of all the possibilities! Flowers, eggs, bunnies, chicks...hang on, I better grab a notepad.